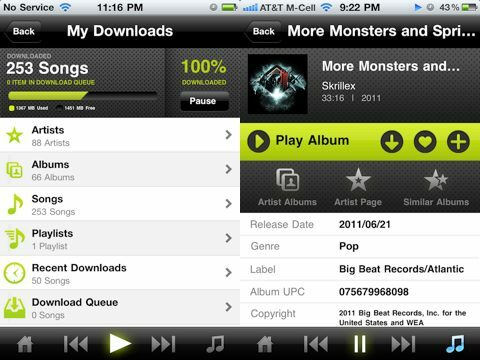 Kazaa is back and they have an iPhone app to go along with their subscription based music streaming service. When you download the free Kazaa app from the App Store, you’ll be asked to log in to your Kazaa account. There is no way to actually sign up for a Kazaa account from the app itself. This is most likely to avoid having to pay Apple a commission for new sign ups. You can however just go to m.kazaa.com on your iPhone and sign up for an account there. You just enter your name and email, along with your iPhone number. You will get an SMS message from Kazaa that contains a pin number. Go back to the website and enter the pin number and you’re signed up. A subscription to Kazaa costs $9.99/month and is billed to your iPhone bill when you sign up on the iPhone. Once you’re done you can go back to the Kazaa app and login to get started. The Kazaa app itself is quite full of features, enough to keep you entertained and exploring around for some time. Searching is pretty easy in Kazaa and you get search suggestions for artists, albums or songs as you type which is a wonderful time saver especially on the iPhone. Once you land on an artist page, on top you’ll see album covers for all the releases that Kazaa has for the artist. This is pretty easy to navigate using flick controls. 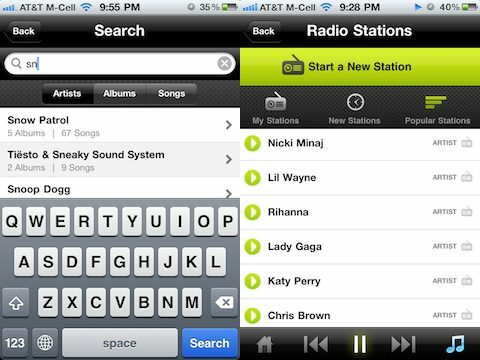 For more control look on the bottom of the screen for an Album List, Song List, Top Songs, and Smiliar Artists. If you’re in a hurry, you can also play a custom radio for the artist in with one tap. You can also heart any artist, song, or album in the Kazaa app. When you get to a list of songs you’ll have options specific to that list. This list can be either songs in an album, songs in a playlist, songs in a radio station, or just a list of popular songs. Options include playing the entire list, hearting the entire list, adding the list to a playlist, or downloading the tracks in the list for local offline playback. When you’re looking at songs in an album, you’ll see released year, total playback time, and can dig even deeper by tapping the i button to see the full release date, genre, label and more. Another hidden feature here is a link to a list of similar albums, although it takes a long time to get the results. On the bottom of the Kazaa app you always have a play menu that gives you pause, play, next, previous, home and now playing buttons. For some odd reason only the pause button lights up, and the other buttons are dimmed. When you get to the now playing screen you’ll have a button for viewing a list of the songs in your queue which can be added to a playlist or edited. The now playing screen always has a volume slider visible which is a bit annoying. 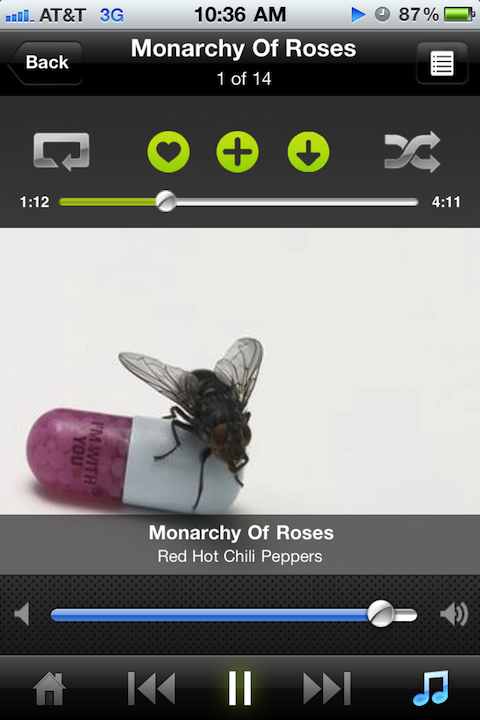 Tap the cover art once to toggle the options screen where you’ll find the seekbar, shuffle, and repeat buttons. It feels like maybe the volume and seekbar sliders should be swapped out. Another thing that is lacking in the now playing screen is the ability to jump to the now playing artist or album’s page. This feature is something that Spotify has and I’ve become so used to it. From the home screen you can discover new music from a few Kazaa created lists which can be pretty insightful. Kazaa gives you a list for Popular Music, New Music, and Editor’s Picks. Kazaa also has a concept of radio stations, some of which are created by others and made public for everyone to listen to. Settings give you the ability to clear your download cache, and set the stream quality to high which I would reccomend if you have an unlimited data plan. You can also pick high quality downloads, and pick Wifi only mode if you’re tight on data transfer on your plan, or even pick the offline mode. The selection of music in the Kazaa library is not bad. I was able to find some albums in Kazaa that I could not find in Spotify, and vice versa. To that end, I would say that none of the two are by any means comprehensive, and I’m sure each company is dealing on a daily basis to with record companies to add new albums and songs. To clarify, while you can “download” songs on the Kazaa iPhone app, these songs are not yours to keep. They are only temporarily stored for offline plackback ability. The other aspect to consider is the desktop access option. Kazaa has a website for desktop access so you can listen to music from a web browser. Spotify offers a standalone app which looks a bit like a dark skinned iTunes. If you love web based music, and don’t mind not having a dedicated app, you’ll be happy with Kazaa. Personally, I prefer having the standalone app, and it would be nice if Kazaa also offered that option. Having said that, Kazaa’s website is quite fast, useful and has a ton of features great for easily discovering and playing songs. Finally, iPad users will be disappointed to know that there is not yet a tablet app for Kazaa. As with Spotify, you can install the iPhone app on your iPad and use it there. You can also visit the Kazaa website via Safari on your iPad and listen to your music that way. Overall, I prefer the user interface and the social aspects of Spotify over Kazaa, although the Kazaa app does have a few additional features like top tracks and popular songs which Spotify currently does not. The Kazaa app also did freeze and crash a few times while testing it out and certain songs lagged a few seconds before starting to play. 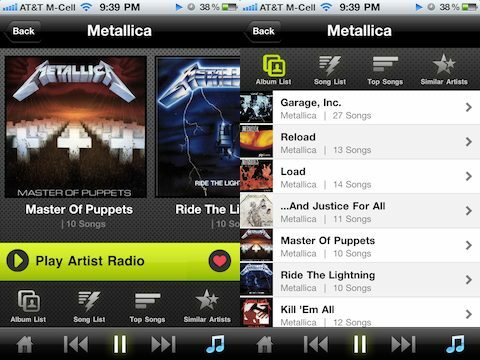 With a little more fine tuning of its iPhone app and social features, Atrinsic’s Kazaa could be a solid music subscription option for iPhone users. AppSafari review of Kazaa was written by Joe Seifi on September 23rd, 2011 and categorized under App Store, Music. Page viewed 6320 times, 1 so far today. Need help on using these apps? Please read the Help Page.